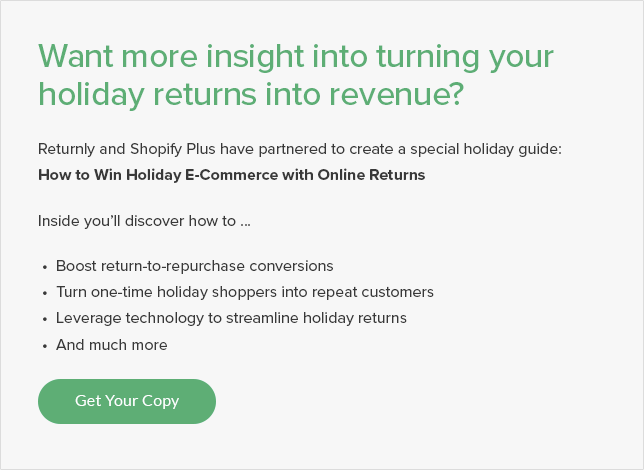 In the webinar, How to Manage Holiday Returns, I sat down with Thomas Marks, VP of Marketing at Stitch Labs, to discuss best practices to manage returns during the rush of the holiday shopping season. Many of these best practices can be helpful as you navigate post-Christmas returns as well. Here are some key takeaways from that discussion. First and foremost, don't assume your holiday returns are lost sales. At Returnly, we're finding that when you credit shoppers with an instant store voucher at the start of the return process it affects both decision making and willingness to spend, as shoppers are often inclined to think of store credit as free money. On average, we are seeing 41% of shoppers opt to exchange or buy again with a 110% uplift. If you invest the same level of detail into your post-purchase strategy as pre-sale, you can make a significant impact in your brand's Gross Margin, Lifetime Value, and Net Promoter Score. 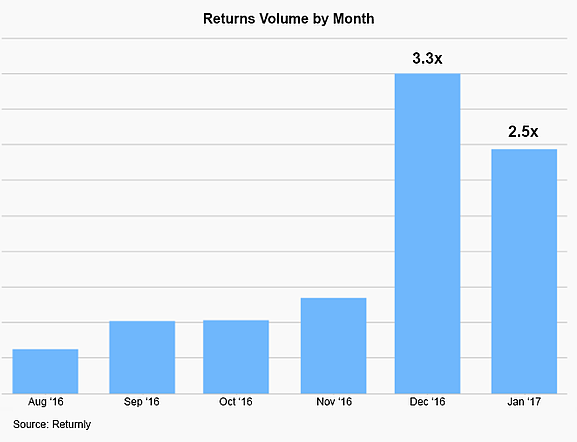 Last year, the week of December 26th was by far the largest spike in returns, but heavy volume remained steady throughout January as well. Staff-up your teams to accommodate these post-holiday spikes. In the New York Times article, Christmas May Be Over, but Holiday Shopping Is Not, Shoppertrak shares that the day after Christmas was expected to be the fourth busiest shopping day of the season, with the Saturday after Christmas expected to be the ninth busiest day. What we’ve found is that 3-5 days after a sales uptick, you’ll see an uptick in customer support requests and ultimately an increase in return and exchange requests. Keep in mind that while part of the volume is due to higher sales, it's also a time when many brands are introducing new products. These new products may have return rates and reasoning that you won't discover until the product starts shipping. Ten years ago, Zappos made free shipping the new customer norm. Today, customers expect easy and free returns when shopping online. Not only are free returns a great customer experience but it can increase sales as well, boosting spending up to 357%. If free returns aren't right for your e-commerce business, promote other aspects of the returns experience such as speed of refund or ease of experience. These are powerful differentiators, particularly during the holidays when shoppers expect product as quickly as possible. Outdoor Voices is a great example of a brand marketing their returns policy to help drive sales. I often see brands offer different policies for different products within their line, e.g. footwear, denim, shirt, etc. To your shoppers, it's all one brand and one experience. 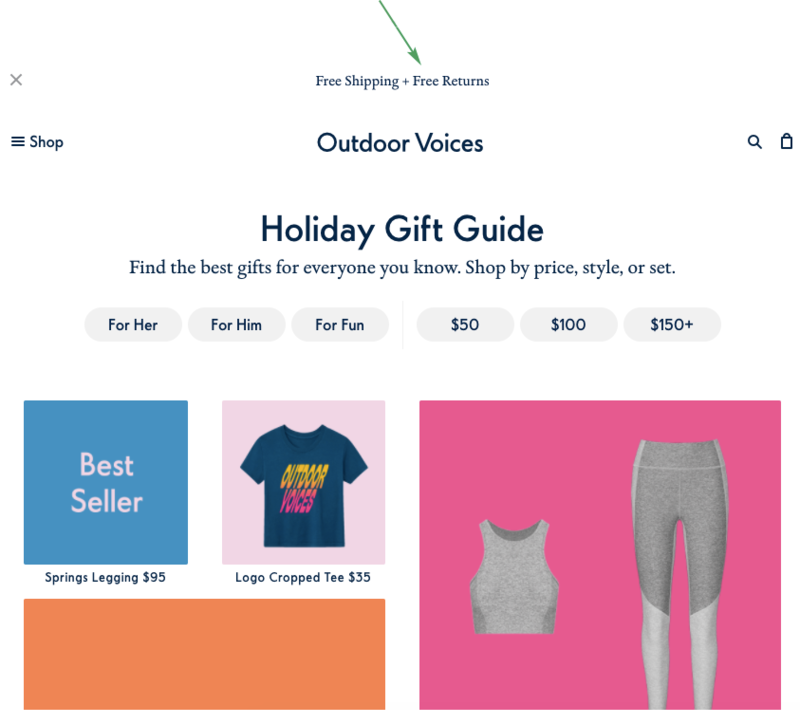 Offer a uniform policy across your site that's clear and easily digestible to make sure shoppers have a positive experience without having to worry. Maintain consistency in your policies internally, as well. Talk to your warehouse team, customer support, and finance to make sure everyone knows the in's and out's of your policy. Ensuring that every team member is on the same will lead to a more efficient and more successful returns process down the road. 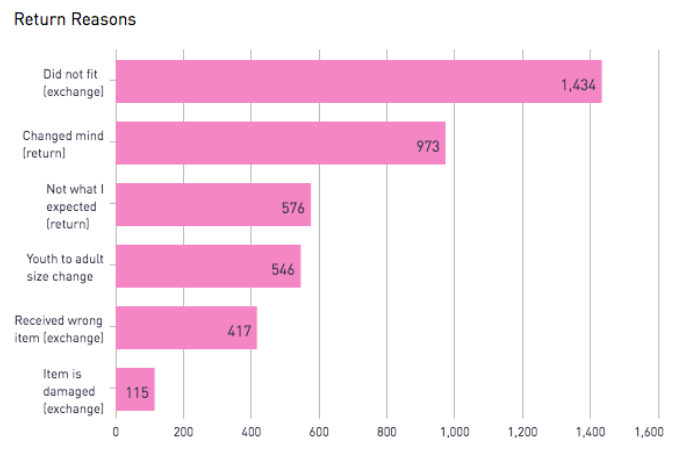 Returns have a big impact on every online retailer's bottom line. With holiday return rates close to 30%, it's important to understand how returns can affect other areas of your business. Make sure to define the reasons for returns upfront, so you have consistent data and can develop a plan for how you're going to act on it. e.g., replenish, redesign, resize, etc. In addition to merchandise planning, you can also use returns and exchange data to build targeted marketing campaigns. e.g. Does one demographic typically return a specific style for another? Use the information collected over the holidays to inform your marketing messages and re-target current customers. With 39% of new holiday customers making a second purchase during the same holiday season, this is the best time to re-connect with your holiday shoppers. Will is Customer Success Manager at Returnly, where he works to help brands and retailers optimize product returns and reach their post-purchase goals.